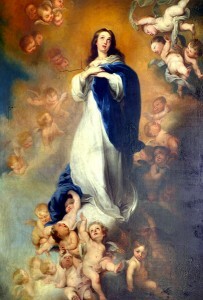 The Feast of the Immaculate Conception is a holy day of obligation celebrated every year on December 8. The word immaculate comes from the Latin word immaculatus, meaning free from spot or stain. With the date being so close to the birth of Christ, those new to the faith or young worshippers sometimes confuse this day as one where we celebrate Jesus’ conception. This day, also called the Solemnity of the Immaculate Conception of the Blessed Virgin Mary, focuses on Mary’s conception, not Jesus’. Mary is given the title “Immaculate,” because from the beginning of her existence—from her conception, she was spotless and pure. She was born without original sin. During the mass on the Feast of the Immaculate Conception, the Church chooses the story of Adam and Eve as the first reading. Being born with original sin means we inherited the sin committed by Adam and Eve when they ate the forbidden fruit. The Vatican describes original sin as, “By his sin Adam, as the first man, lost the original holiness and justice he had received from God, not only for himself but for all human beings. 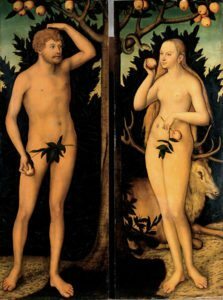 Adam and Eve transmitted to their descendants human nature wounded by their own first sin and hence deprived of original holiness and justice; this deprivation is called “original sin”. Fortunately, God sent His Son to live among us and to ultimately die so that we could be free from sin and death. He offers us the sacrament of Baptism where we are cleansed of our original sin and reborn as children of God. “I will sprinkle clean water on you, and you will be clean; I will cleanse you from all your impurities and from all your idols (Ezekiel 36:25). Baptism, however, doesn’t free us from all future sin. We are all tempted and inclined to sin, yet God gives us His grace to try to sin no more. We have the free will to choose to walk with or without Him towards the path of eternal life. Perhaps the most important takeaway message from this feast comes from the second reading of the mass. It comes from Ephesians 1:3-6 and tells us, “In Him we were also chosen, destined in accord with the purpose of the One who accomplishes all things according to the intention of His will, so that we might exist for the praise of His glory, we who first hoped in Christ.” We are reminded that we, too, were chosen by God—just as He chose Blessed Mary—to live a holy life. We should follow Mary’s example of humbling ourselves before God and willingly choosing to live our life according to His holy will. Blessed Mary gave birth to Christ the Savior, and we are called to give spiritual “birth” to the Word of God each day—in our words and actions.